Hi dear friends! 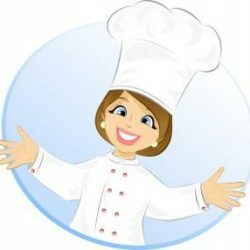 This is my 100th post… I never ever thought that I would post so many recipes! It is because of your love and encouragement that I am able to do so….! My FireStats shows 68902 visits and 164033 page views as I am posting!!! This is one reason why I want to continue blogging…! Marinate the mutton pieces with curd, turmeric powder and salt for 30 minutes. Heat oil in a pressure cooker and add the onions. Saute till it turns light brown. Add the ginger garlic paste and saute for a minute. Now add the tomatoes and green chillies and fry till oil separates. Add the spice powders and fry till aroma comes out. Now add the marinated mutton and mix well. Do not add any water. Close the lid and cook till done. Open the cooker and add chopped pineapple, coriander and mint leaves. Simmer till the gravy is thick. Wash and soak the rice for 20 minutes. Boil water in a large vessel. Drain and add the rice, whole spices and salt. Cook till the rice is done. See that it is not over cooked. Strain through a sieve and allow it to cool. Heat oil in a pan and fry the onions till golden brown. Fry the cashew nuts and raisins in the same oil. Keep aside. Soak the saffron in the milk and add rose water to it. Take a large vessel and smear the bottom with 1 tsp of ghee. Spread 1/3rd of the cooked rice. Sprinkle the rice with some milk mixture. Spread some fried onions, nuts and raisins. Layer it with half of the cooked mutton. Add some ghee. Repeat the process and end with rice on top. Sprinkle milk mixture and add some ghee. 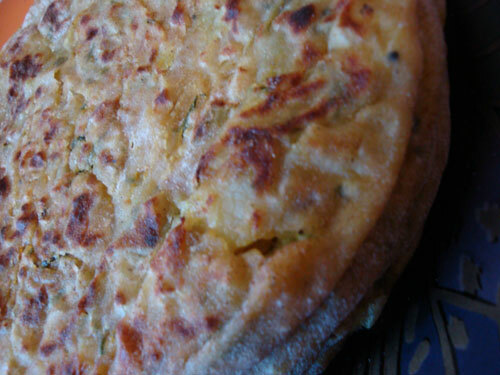 Decorate with fried onions, nuts and raisins. Close with a tight lid and keep it on a low flame on the small burner for 20 minutes. Switch off the flame and allow the Mutton Biriyani to sit for another 15 minutes before serving. Serve hot with tomato salad, pickle and pappads. Enjoy! Take the onions and green chillies in a bowl. Add well beaten curd and salt. Mix well. Add the chopped tomatoes and mix together. 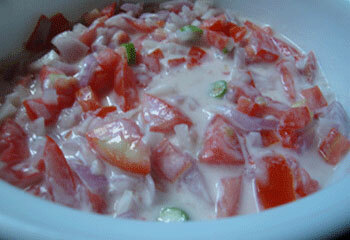 Serve Tomato Salad with Biriyani or Pulao. Happy Birthday again dear Lissie. The mutton sounds delicious. What a coincidence, I wrote about saffron today. Congrats on ur 100th post….Wishing u many more to come! 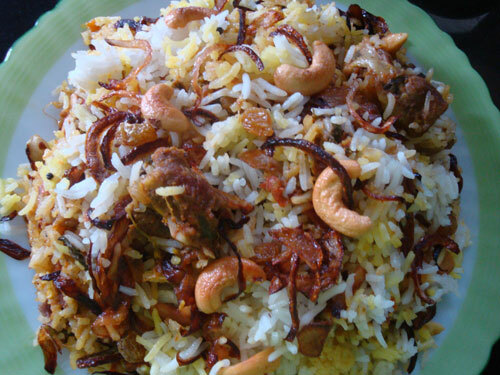 Woww tempting briyani dear, wat a excellent way to celebrated ur 100th post..congrats and keep rocking..
Congrats on ur 100th post dear! keep rocking…n xllnt click as usual! May god shower you with all the blessings this day can hold!!!!! Century, yay!Lots of love to u and ur blog and to that birani too. Doesn’t it look enviably good? pls pls do check ur gmail…. Happy Birthday and Congrats on ur 100th post. It is no wonder you have so many visitors when you cook recipes like this! 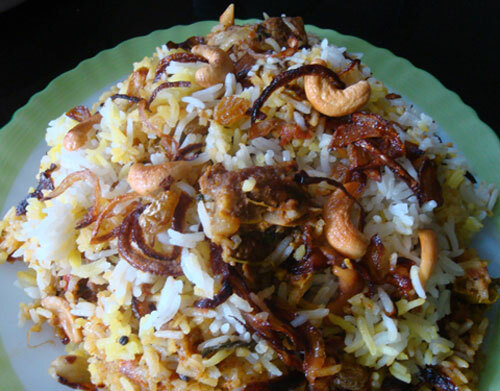 I would love a plate of your biryani Lissie is looks and sounds so amazing! Thanks a lot Ivy! your post on Saffron is very informative! Dear Lissie, I would like to know how to cook perfect rice .I only know the microwave method. Would be great if you help me . Thank you and God bless. Dear Bindu, to cook perfect rice, add 2cups of water for 1 cup of rice to a rice cooker and cook till done. This is the easiest method. If you are using a pressure cooker, cook for 4 minutes on a low flame, after the first whistle. This measurement is for Basmati or raw rice. Basmati rice needs to be soaked for 30 minutes before cooking. God Bless you too! Dear Bindu, if you are preparing rice for the biriyani,soak the rice for 20 minutes and then cook it in enough water till the rice is 3/4th done. Then drain the water through a sieve and allow it to cool before layering the biriyani. Dear Lissie, thank you for your prompt reply. Planning to do this next week. Will let you know how it comes. Once again thank you.